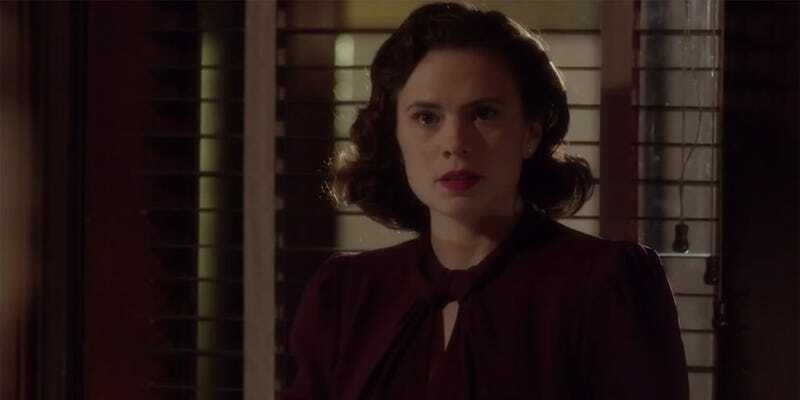 By Force or Trickery: Secrets of Agent Carter episode "Time and Tide"
Marvel's Agent Carter is back with a surprisingly diverse set of emotional punches and more of the most obscure Marvel characters ever. Let's see just how far into the back issue bins the show dug for some comic book references! This was a descent enough episode over all, but speckled with biting emotional punches - Who is being threatened by who? What dark secrets destroy reputations? How horrible can these guys be? But how affected can they be by tragedy? A strange emotional rollercoaster. The Spoiler-Light Recap: Peggy is secretly following her only lead to find the bad guys, but her co-workers are following their leads right towards Peggy! Friendships will be strained, major characters will die! Trying to uncover the secret of the mysterious heart-shaped symbol Brannis left her last episode, Peggy cracks open a copy of The Complete Works of William Shakespeare, which for some reason includes a full copy of a book of symbols inside. Is this a production error or is there actually such a book out there? Either way, the search turns up naught, but there's an odd little bit were a suitor named Jimmy sneaks not-so-stealthily past Peggy to find his girlfriend, Bonwit Teller employee Molly Bowen. Their liaison is quickly uncovered by the irascible Miss Fry, and Molly is booted from the Griffith Hotel. Harsh. Interestingly, one of Peggy's other hotelmates is a nurse - is it too much to hope she's named Nellie? In the mid-to-late 1940s (when this series takes place), Marvel's biggest sellers were humor magazines, including a decently popular comic called Nellie the Nurse with the goofball misadventures of the titular Nightingale. She was part of a line of female-centric comics that ran from the 40s to the 60s, including Sherry the Showgirl and Millie the Model. Miss Fry makes an allusion to Harry Houdini to insult Molly in the most roundabout way possible, and the master magician has been referenced before in Agents of SHIELD, but it's too bad they couldn't reference a Marvel magician like Monako or a contemporary. At any rate, Peggy Carter and her friend Angie Martinelli (her full name said this episode) meet a new tenant named Dorothy "Dottie" Underwood, a ballerina from Iowa. She seemed significant somehow. Time will tell. Angie also name-drops her cousin Ralphie who got hit by a bus, so there's that. Neither here nor there, but other websites spotted something I missed. The Lucky Star Cab Company from Captain America: The First Avenger shows up in several b-roll shots. It's really too bad they didn't use Taxi Taylor instead, as he was an actual superhero cab driver from Marvel's 1940s comics. More recent comics revealed he'd also invented a robot called T-Mech while working for the army, so that's pretty cool. Following their own leads, the SSR finds the Leviathan typewriter communicator in a sleazy hotel room, and we learn the Leviathan agent used aliases like Alfread Lean (that's how the subtitles spell it), Orson Hawks, Frederico Rossellini, which we are told are all film references. Presumably this is alluding to Alfred Hitchcock, David Lean, Orson Welles, Howard Hawks, Frederico Fellini, and Roberto Rossellini. Odd thing though, is several of those guys wouldn't have been very well known in 1946, so Dooley is clearly a film buff himself. When the SSR digs deeper, they learn Leet Brannis and Sasha Demidov (the heretofore nameless assassin) were part of the 478th Russian Rifle Division, officially killed along with their unit in '44 in the Battle of Finow, Germany. The mystery deepens. We learn a lot more about Edwin Jarvis following a harsh interrogation by Thompson. Apparently Jarvis adventured as a young man, hiking with "a very amusing Spaniard" in the Himylayas and serving in the British military under a general just before WWII. He met his lady love Anna in Budapest where she worked in a hotel tailor shop, but when the war started Jarvis knew she would be targeted for her Jewish faith. Unable to get the general's help, Jarvis forged documents to save her, leading to his dishonorable discharge and treason charges, but Howard Stark swooped in and saved both Edwin and Anna. No wonder he's so loyal. He's saved again, this time from Thompson by Peggy and the organized police work of Detective Davis of the 19th Precinct. There is a Detective Davis in the comics, but this seems too obscure for even this show. Jarvis also flippantly says Stark has a "death ray" in Nevada, and how much would you bet that there's more truth than lie in that statement? My wife was convinced Jarvis was still single and that "Anna" might have been his mother (and he was just pretending to be married for whatever reason), but this confirms his non-bachelorhood. Pity they didn't use the name of his long-time comics girlfriend Glory Garsen. Following the stolen goods, Peggy and Jarvis find much of it aboard Brannis' boat "The Heartbreak," including a glowing green device called the Constrictor that breaks bones (despite being intended for massages). Of course, Marvel has a cult-favorite villain (and sometime anti-hero) called the Constrictor, but Marvel had a similar constriction-themed snake villain in the '40s called the Python. The green-skinned flexible Python is significant in that, while most WWII-era villains only lasted one story, he appeared in multiple issues and fought multiple heroes. The crates were protected by a big guy named Jerome Zandow, who was a sideshow strongman on Coney Island before turning to crime. Interestingly, despite the supposed ban on cliché words like "dame" and "broad," Zandow uses both terms to refer to Agent Carter. Like Leet Brannis, this is another super-obscure villain in that he only appeared once. He was one of several members of the Circus of Crime who fought Cap in Captain America Comics #5 (1941). Marvel has had various Circuses of Crime fighting heroes going as far back as the Old West and going all the way up to the modern day, but Zandow only appeared with the team once. Zandow is assassinated this episode, along with regular-for-the-first-three-episodes Agent Ray Krezminski. The show has gone out of its way to show this guy as dumb and borderline incompetent, but this episode really raises (or rather lowers) the bar by depicting him as a philandering jerk on a first-name basis with random prostitutes. In fact, he was hoping to meet with one of his lovers during this episode, even trying to get Butch (presumably Agent Wallace from the credits) or Agent Yauch to cover for him while he philanders. And yet, his death severely affects the entire department. My wife, who was a cop, points out how realistic this is, but it seems almost jarring considering how little death seems to matter to other genre shows. Here even a scumbag deserves a memorial. Thankfully, Chief Dooley called Krezminski's wife to break the news. Thompson called Krezminski's girlfriend. Okay, we didn't get to address the "special thanks" section last time, so here's a bit now. This episode thanks Marvel Studios producer Victoria Alonso, Marvel Studios concept artist Rodney Fuentebella (art above), and long-time comic book creator John Byrne. John Byrne created Dooley for the Sensational She-Hulk graphic novel and has been a driving force in comics for decades. In the 1980s he shaped the destinies of Superman and the Fantastic Four for years to come. Last episode thanked others, including Captain America: The First Avenger director Joe Johnston, legendary comic book writers Archie Goodwin and Steve Englehart, and iconic artists Don Heck and Sal Buscema (Sal's art above). The latter four (along with Byrne) created some of the best Captain America stories of the past fifty years. The late, great Joe Simon also received special thanks, as he co-created Captain America with Jack Kirby. For a little perspective, Stan "The Man" Lee, who is often credited as the father of the Marvel Universe, didn't write his first comic until Captain America Comics #3 when he was a teenager, already following in Joe and Jack's footsteps. See you all next episode, same Carter time, same Carter channel!